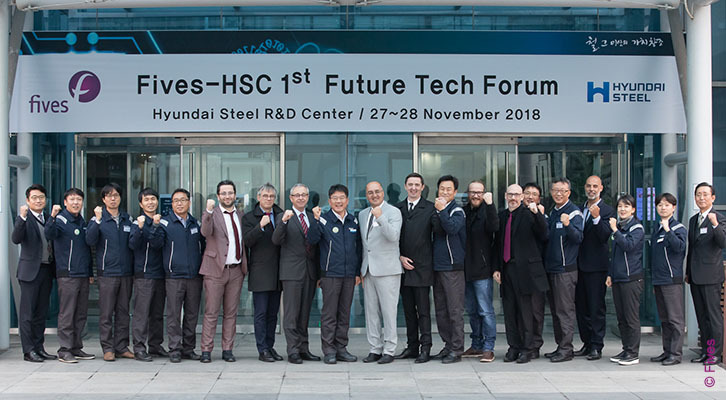 Hyundai Steel, a pioneer steel maker in South Korea, invited Fives, an international engineering group on November 27-28, 2018 for a Future Tech Forum. 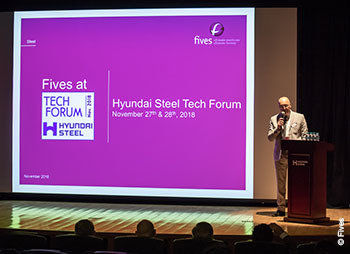 It was the 1st Future Tech Forum organized between Hyundai Steel and Fives where both companies shared views on the evolution of the automotive steel market, key process technologies for the 3rd generation advanced high-strength steels, as well as challenges in energy saving and environmental performance. Hyundai Steel was represented by a large team of managers from its technology division, R&D center and different plant production units. Fives has presented its disruptive technologies in-series of several seminar sessions which covered “Slab reheating furnaces”, “Pickling, rolling, pre-treatment”, “Annealing & galvanizing” and “Smart factory”. Fives’ experts have touched on product quality expertise, in particular for automotive coated products, metallurgical support, process and quality management. Fives also presented the full range of its digital solutions, including DMS OptiLine™, a precise software tool to simulate the complete strip running in a processing line, AdvanTek® combustion control system to optimize combustion efficiency and minimize NOx emissions, as well as Eyeron™, a real time quality management system that captures and analyzes data from all production units of the steel plant. Dr. Ju-Tae Choi, Vice-President of Process Technology Division at Hyundai Steel highlighted that he was highly impressed with Fives’ technologies and smart solutions and looks forward to developing a close cooperation between the two groups.